I was excited to write about a pair of socks that I just finished knitting, but I’ve discovered a mistake. I’m tempted to call it a “rookie mistake,” but that may be too harsh. It’s more of a communication mistake. I’ll start with the yarn. 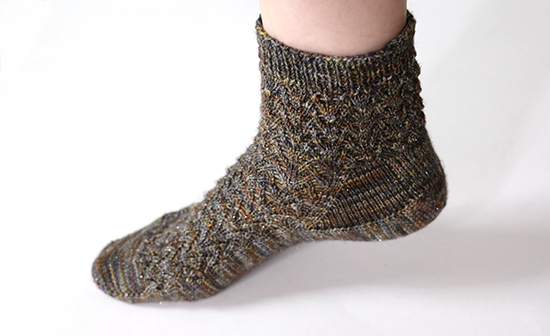 I was gifted a skein of Zen Yarn Garden Serenity Glitter Sock in the colorway Ooak Armada. The yarn is an amazingly soft and springy blend of 80% merino wool, 10% cashmere and 10% metallic fibers. The color could probably be best described as a rusty lead pipe with flecks of glitter, and I don’t think there’s a colorway that suits me more. I was also gifted a set of Skacel Addi FlexiFlips, which are a new line of knitting needles that are a cross between double points and circulars. They come in a set of three, perfect for knitting smaller items in the round. I’ve heard other knitters say it took them a while to adjust to these needles, but they felt comfortable to me right away. In addition, I received some Miss Babs Mood Bead Stitch Markers. Do you remember mood rings, which changed color depending on the heat of your hand? That's what these are, but in stitch marker form. How fun is that? I chose the pattern Small Capitals from the book “Sensational Knitted Socks” by Charlene Schurch — my go-to sock pattern source. Bringing these together should have been a perfect storm of happy, indulgent knitting. Partway through, I started to have my usual FORO (Fear Of Running Out). Because this pattern happens to be constructed from the toe upward and the yarn doesn’t have a noticeable color repeat, I pulled the yarn end from the center of the ball and started knitting the second sock on another set of needles. By knitting both socks at the same time, it was easier to see how much yarn remained as I knit the leg of each sock. Can you see where this is going? Both sets of needles are labeled as US-1. I didn’t swatch again because the needles are the same size. Except they’re not the same size. The second set of needles are the standard 2.25 mm but the FlexiFlips are 2.5 mm. By rights, the FlexiFlips should be labeled as US-1.5. 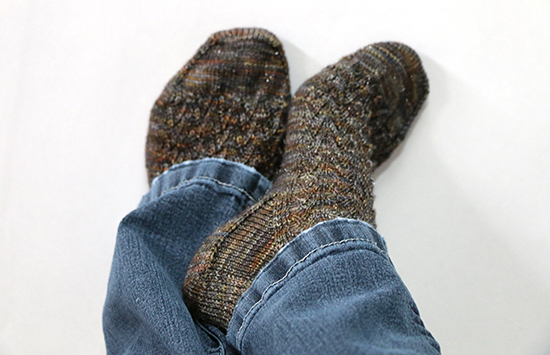 I finished knitting the socks, noting only that the stitches seemed a little tighter on one sock as I wove the ends. Then I tried the socks on and noticed that they felt a little different. Upon closer inspection, they also looked a little different. The socks are definitely different. I don’t know if I’ve ever been more in favor of the metric system. I was able to shrink the larger sock somewhat with a spin through the dryer. While I already have a couple sets of 2.25 mm knitting needles, this is my first set of 2.5 mm needles. And I am now more keenly aware of the variations in US knitting needle sizing conventions so I can avoid mistakes like this in the future. Have you ever been snagged by an unexpected US/metric conversion? I think you are amazing to be able to knit socks! I "heart" them! Thank you! They're my favorite knitting project because I can wear them in any season. Thank you, I'm definitely more mindful of needle sizes now!